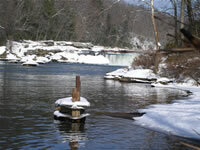 LOCATION.--Lat 39`52'15", long 79`29'35", Fayette County, Hydrologic Unit 05020006, on left bank 900 ft downstream from Route 381 highway bridge at Ohiopyle and 1,100 ft upstream from mouth of Meadow Run. PERIOD OF RECORD.--June 3, 2002 to current year. GAGE.--Water-stage recorder and Pluvio precipitation gage. Datum of gage is 1,164.67 ft above sea level. Satellite telemetry at station. Supplied by NWS: Action stage-10 ft; Flood stage-20 ft; Moderate flood stage-22 ft; Major flood stage-25 ft.